For those who travel with babies and toddlers, a stroller is part of the baggage you carry. Most airlines have fairly standard procedures on how strollers are handled. 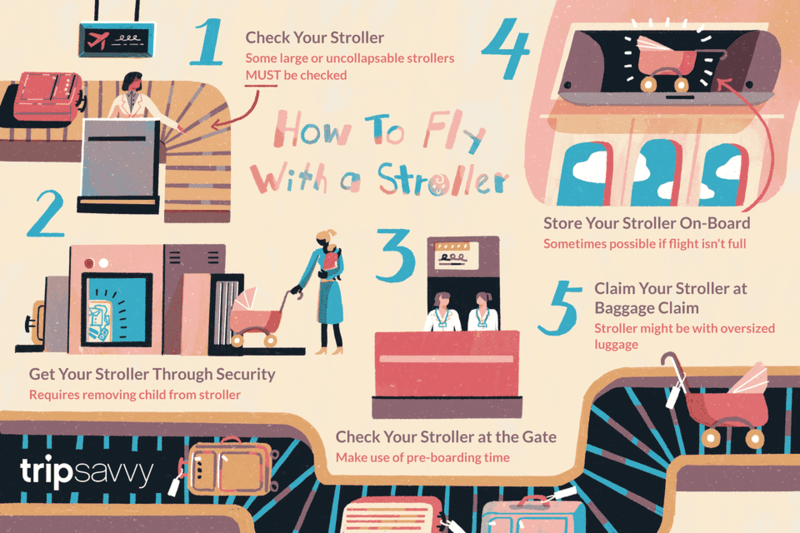 You can survive the stroller process, from the airport to the airline to baggage claim, by following the six simple steps, outlined below. At check-in, the agent will ask if you want to check the stroller with your baggage. If not, you can check the stroller in with the gate agent as you board the flight after receiving a tag for the stroller. Large collapsible strollers and strollers that don't fold or collapse are usually only accepted as checked luggage, so it's best to call your airline if you have any questions. If it's determined that your stroller needs to be checked, ask the ticket agent for a plastic bag to keep it clean while it's in the cargo hold of your aircraft. Upon arrival at the airport security screening checkpoint, you will be expected to remove the child from the stroller and send the stroller through x-ray screening machines. Some airports have lines that are designated for families so you don't feel as much pressure to rush through the security checkpoint. Arrive at the gate area early enough to make the pre-boarding time that happens before general boarding. Airlines offer early boarding for those who require assistance or are traveling with young children, including with strollers. This gives the airline ample time to load strollers that have been tagged and left to be checked on the jetbridge. It also gives parents extra time to board the aircraft and get their babies and toddlers settled in before the rest of the passengers get on the flight. After the flight lands, strollers are brought back up to the jetbridge and are waiting for passengers as they depart from the aircraft. If a flight isn't full, you may be able to carry an umbrella-style stroller onboard and store it in the overhead bin. That allows parents to have easy access to the stroller and not have to wait for it after leaving their flight. It can also reduce the chance of the stroller being lost during a transfer to another flight. Making connecting flights with strollers can be tricky. A gate-checked stroller tag has room to add the flight number of the connecting flight. So the stroller can be dropped off again after boarding the connecting flight or can be retagged at the next gate. At the end of your journey, you end up at baggage claim. The larger stroller you checked should either come out with the rest of the luggage from the flight or be put over in the oversized luggage area. If the stroller is lost, use these tips for getting it back.